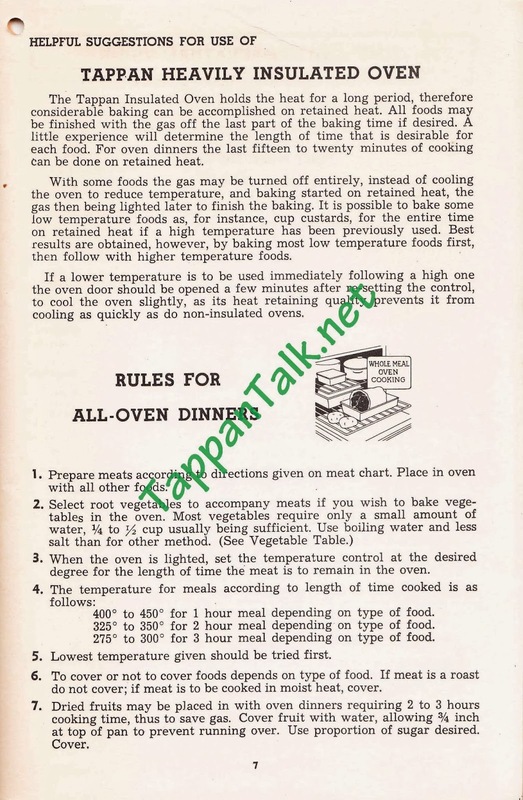 I recently received a request from Katy for cooking tips when using a Tappan oven. This is a topic that I don't think we have touched on previously. The Tappan Deluxe models (and probably other models too) have what is described in Tappan Materials as a "heavily insulated" oven. They actually talk a little bit about it in some of the Owners' Manuals. I have included one of the pages below. Hello. My uncle has a Tappan stove. It is model number 64, lot No. c. It is from the 1950s. He would like to sell it. It still works, and he is the original owner. An antique store owner said it was only worth $100. Do you know if that's true? My guess is no, depending on the condition. If it's missing parts and is chipped, banged up or needs porcelain or chrome it's still worth more than $100 if it is good working order. Do some research. Restored stoves can go for $2,000-$4,000. Sounds like this guy was trying to take your uncle to the cleaners, then make a big profit reselling the stove.